For Ubuntu 10.04(Lucid Lynx),Eclipse Java Development Tools is one of the best IDE(Integrated Development Environment) available.Eclipse is crossplatform application so you can use it on GNU/Linux based operating system,windows,MacOSX. Eclipse is a great Open Source IDE which has support for multiple programming language by means of plugins.It is well suited as a foundation on which you can construct and run integrated software development tool.Eclipse is free and open source so you can find these softwares in ubuntu software center. 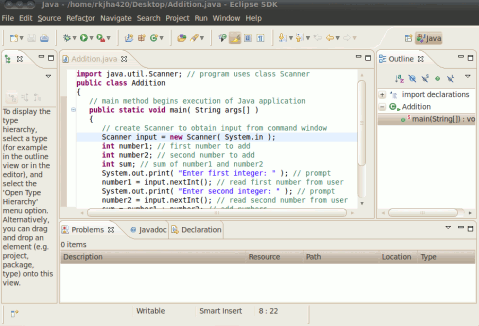 After installing the eclipse platform you can install plugins for java development tools(JDT). To install jdt for eclipse just type “eclipse-jdt” in quick search bar of ubuntu software center.Then click on install to begin downloading and then installing process.Eclipse java Development Tools(JDT) will be installed within few minutes.That’s All..Java Development platform is ready Now!